Eoin Shimizu was only 9 years young when he started at Renmore Gymnastics. He went from playing around the gym to winning medals, until he ended up in our coaching team. He brought with him a unique style and endless energy! Our MAG and Recreational groups will all miss him dearly. The club has been a second home to Eoin and for us he has became part of the furniture. A fine mobile furniture that can go on forever explaining all about the technical moves on the parallel bars and other apparatuses. Eoin is also well known within the theatrical scene of Galway, having played parts in several musicals performing dance and impressive tumbling moves on the stage. But, his dream was always to be up in the air (no wonder he loves tumbling and the rings). Eleven years later from the very beginning with RGC, he is leaving the gym to follow a career with an airline company. We will miss him, his energy and big laugh, but we also would like to wish him the best of luck and much success in his new career path. Thanks for all the years you dedicated to the club while growing with us! After seven years of true love and commitment to the sport, the club and all the gymnasts she trained, it was time for Ariel to say bye to us. It was an emotional goodbye and we felt there were not enough hugs to express our appreciation for all those years dedicated to the club and its gymnasts. We had flowers and a big goodbye hug session. Some of the parents came along and put together a lovely frame with pictures marking those past seven years. It went by so quickly! They say that time flies when we are having fun. So true! We want to wish Ariel all the best in her future endeavours. She was a great asset to Renmore Gymnastics Club and will be sorely missed. We hope she misses us enough to pop by for a visit sometime! We are thrilled to bits to have Dale Moylan back! She was off travelling in Canada for a little while and we were counting the days to have her back. Besides being a great gymnast, our Dale, rocks with groups from our Tumbling Tots to squads. Our gymnasts love her calm and knowledgeable way of teaching gymnastics. Don`t let her fool you with her young looks. She has over 15 years of experience in gymnastics! And impressive power-walkovers! We would like to welcome back our super star Rhythmic Coach, Anastasia Nirkova! She has been on her maternity leave enjoying her brand-new little bundle of joy, baby Christopher, and we have missed her dearly for the last 6 months! We are very excited to welcome her back. Anastasia is a marvelous coach and creates an air of beauty and grace in the room with her beautiful lines, knowledge and style. We are leaping with joy, Anastasia!! Renmore Gymnastics coaches had the great fortune of working recently with the highly inspirational Canadian/GBR coach Carol-Angela Orchard when she visited the club last week on her first trip to Ireland. In addition to the 30+ hour camp that over 50 gymnasts attended for a full week, there were daily coaching clinics and seminars running to raise awareness and help develop the clubs coaching programme. What a totally inspiring and uplifting week we all had, thank you Carol-Angela we cannot wait until your next visit! The Renmore Gymnastics Recreational Coaching Team was hard at work over the Bank Holiday weekend gearing up for the new and exciting Recreational Program being implemented in September. Coaches attending worked on the new levels structure and learned about the new disciplines being added to the program. There was lots of fun had by all as coaches took turns being the gymnasts and working out new lesson plans. All are looking forward to sampling some of these new ideas in the recreational summer camps at RGC this summer. Come on in and give it a try! We are incredibly lucky to have Ariel coaching here at RGC. One reason, among others, being that she is using her Masters studies in Biomechanics to help the gymnasts understand the importance of angles while working yurchenko vaults. By filming with the iPad in the gym they can go through frame by frame, watching themselves, to understand the techniques! Welcome to the team Paula! She’s definitely still got it! 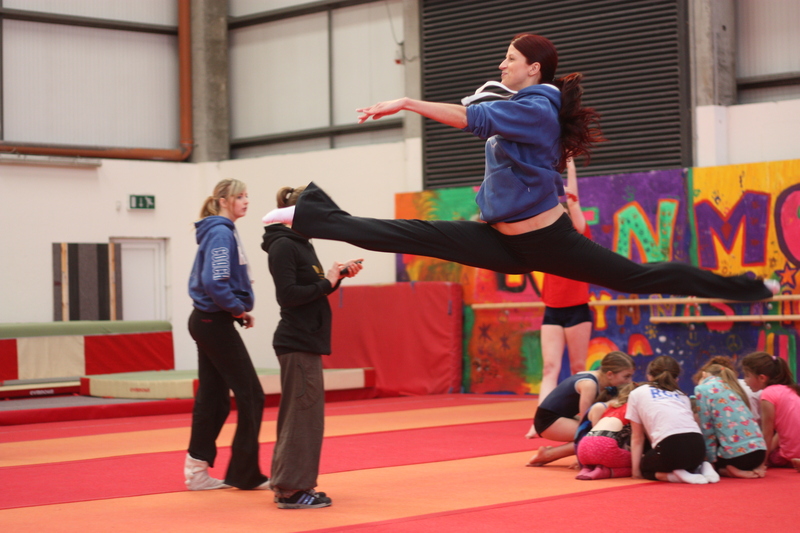 ANASTASIA, our brilliant RHYTHMIC coach, doing a SPLIT LEAP!